History was made today in the Capital City of Delaware. 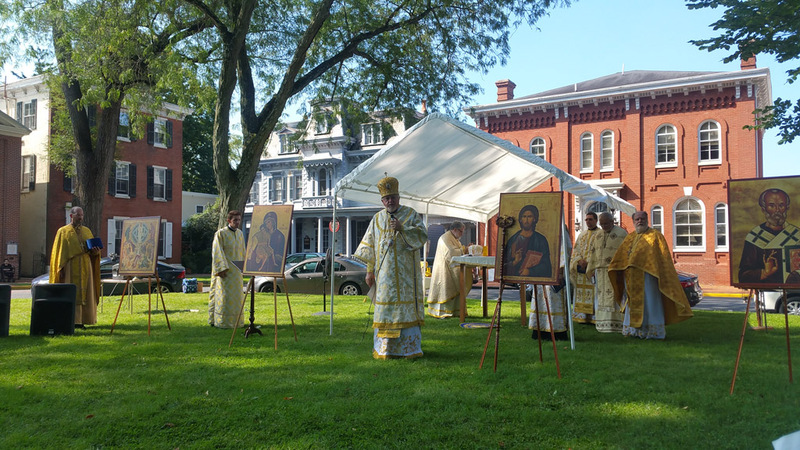 On Saturday, September 16, 2017, His Eminence, +Metropolitan Antony, First Hierarch of the Ukrainian Orthodox Church of the USA and Ruling Bishop of the Eastern Eparchy, celebrated a full Archpastoral Divine Liturgy on the Green in Dover to commemorate the 10th Anniversary of Saint Nicholas Ukrainian Orthodox Mission. 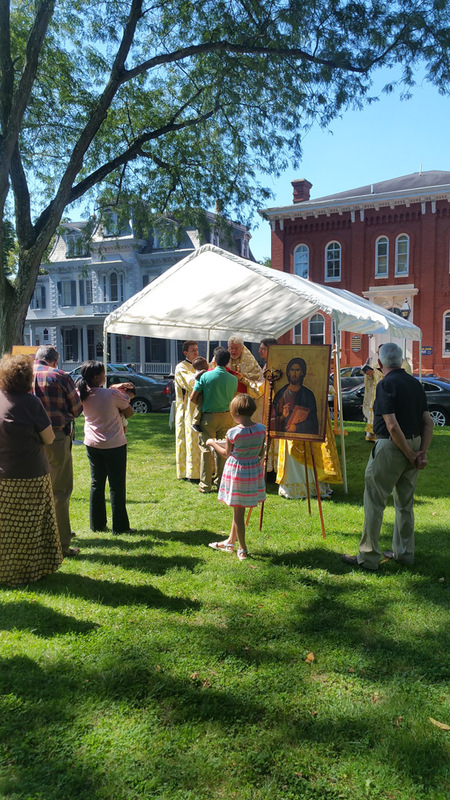 Because the indoor space of the Dover Century Club would have been too small for such an event, an outdoor Liturgy was served. 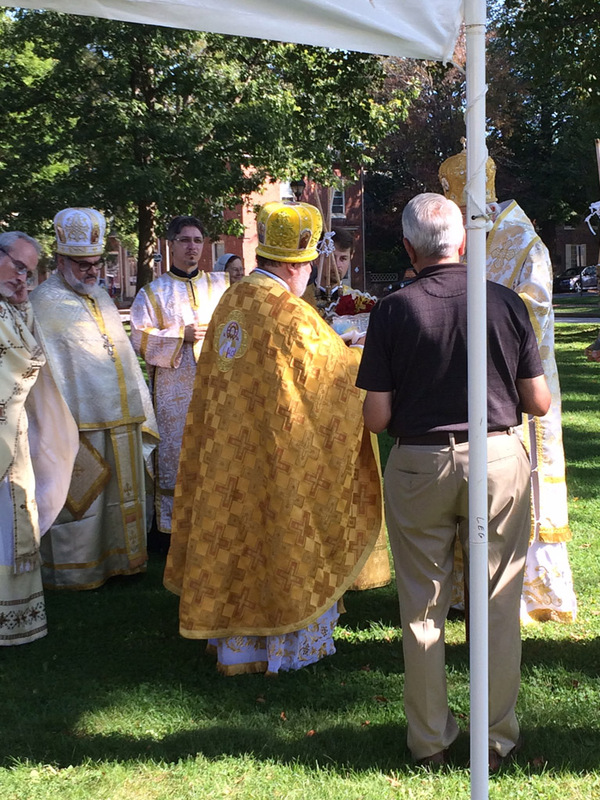 Arriving with His Eminence were Deacon Ivan Tchopko, Subdeacon Volodymyr Yavorskyj and Seminarian Yurij Bobko. Concelebrating priests at the altar were Very Rev. Stephen Hutnick, Pastor of St. Nicholas Mission; Very Rev. Constantine Christo, attached to Sts. Peter and Paul UO Church, Wilmington, DE and St. Nicholas Mission; Very Rev. Dean Robert Holet, Pastor of St. Nicholas UO Church, Charlottesville, VA; Very Rev. Anthony Perkins, Pastor of St. Mary Protectress UO Church, Allentown, PA and Vocation Director and Co-Provost of Saint Sophia UO Seminary, South Bound Brook, NJ; Rev. Philip Harendza, Pastor of St. Michael UO Church, Scranton, PA. Prior to the Liturgy, the Metropolitan was welcomed and greeted with roses by Veronica Perrine, Choir Director of St. Nicholas Mission. 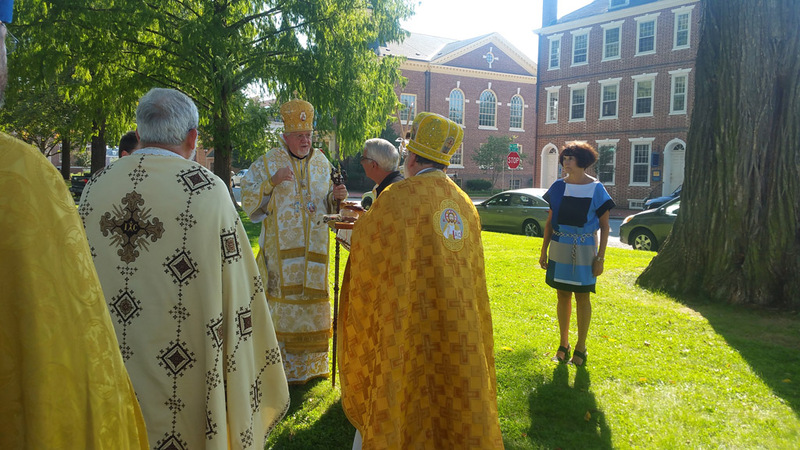 Edward Zabowski, Treasurer of the Parish, welcomed His Eminence with the traditional bread and salt. Father Stephen reminded Metropolitan Antony that his Eminence had always believed that the day would come when this Mission Parish would find a permanent home and become a full Parish of our Church. As we came together to celebrate this day, the Parish is in the midst of buying a permanent home. His Eminence reminded those gathered that all of this is for the glory of God and if Christ wasn’t in the center of the plans, it would be doomed to failure. 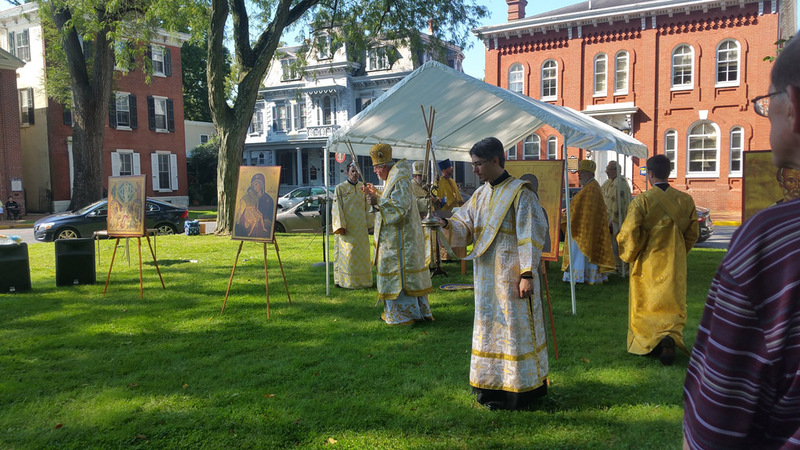 The Archpastoral Divine Liturgy began with the singing of “Ton Despoton” by the joint choirs of Sts, Peter and Paul UO Church and St. Nicholas Mission under the directorship of Nancy Hlywiak. Sharing in this joyous occasion with the Parishioners of St. Nicholas were Parishioners from Sts. Peter and Paul Parish, Wilmington, DE and Holy Trinity UO Mission, Whaleyville, MD. In his sermon, Metropolitan Antony discussed the Gospel of the day in which St. Matthew spoke on the end times. 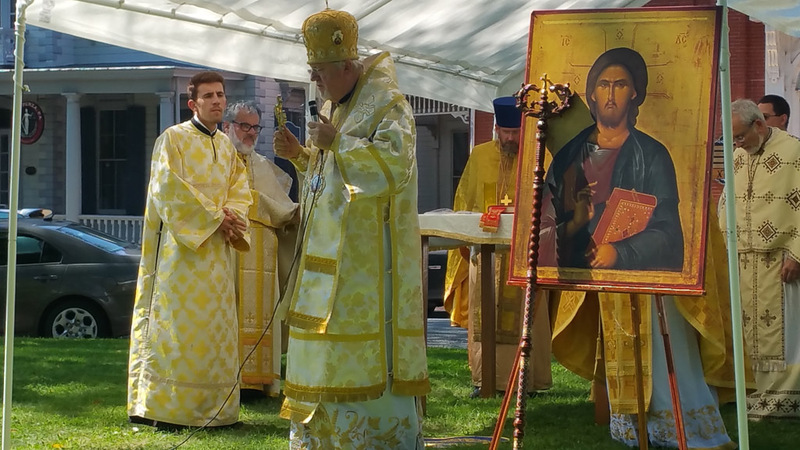 His Eminence reminded all that as Orthodox Christians, we are called to always be aware of our faith in Jesus Christ and how that must be the way of our lives, even when we are persecuted by those who hate us as we see in other parts of the world. It is only in love that St. John the Evangelist reminds us that the world will know that we are truly the disciples of our Lord. His Eminence acknowledged the faith and the hardships that the Parishioners of Sts. Nicholas Mission have gone through over the past ten years. He reminded us that all here present ARE the founders and benefactors of this Parish. 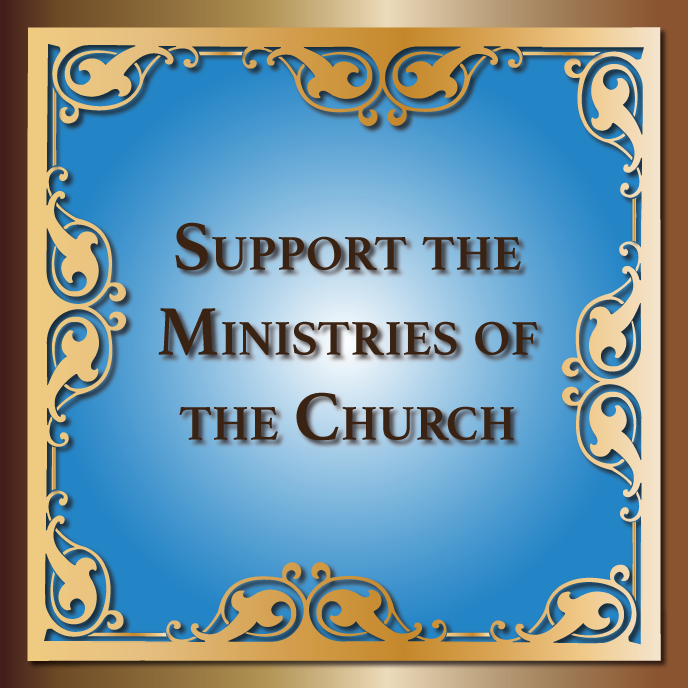 As founders and benefactors we have the duty to bring others to Christ. As we are about to engage in the building up of the Body of Christ by establishing a new Church edifice, we must come and pray more often, not just on Sundays, but as many days as possible. We must be joyous in our demeanor, true servants of Christ, if we are to make a difference in the lives of those around us and bring others to Christ. No one wants to belong to a house of worship where the people are back-biting and unhappy. To be a Christian is to be joyous; full of life and the Holy Spirit. The most important virtue in us must be love, love, love. 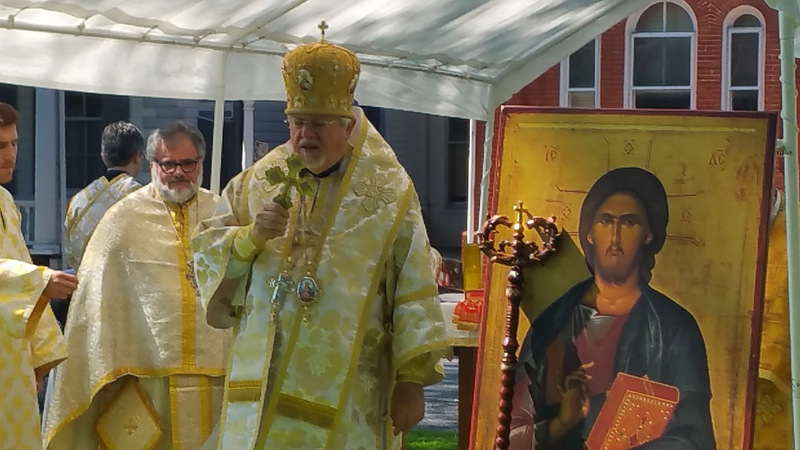 Metropolitan Antony expressed his thanks to the people for their faith, steadfastness and patience in suffering the hardships of looking and finally finding a new home for worship. His Eminence assured those present of his love as their Shepherd. 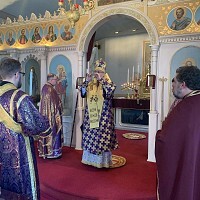 As a reward for their faith, His Eminence raised the status of Saint Nicholas from Mission to a full Parish in the Ukrainian Orthodox Church of the USA. Everyone applauded His Eminence’s announcement. 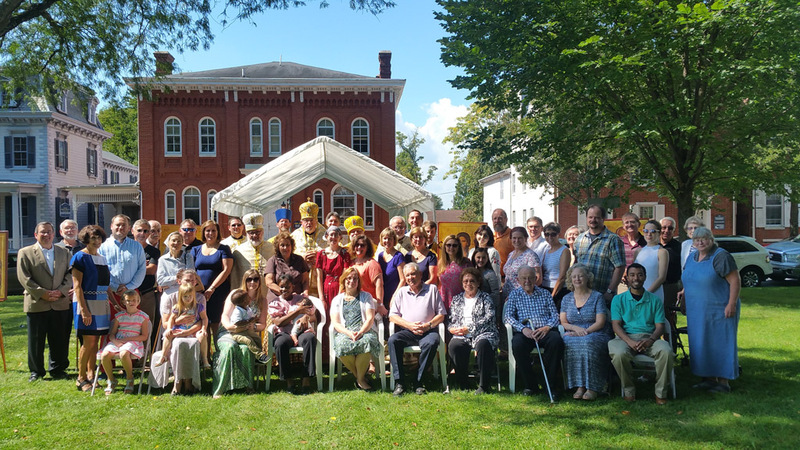 At the end of the Divine Liturgy, a group picture was taken. 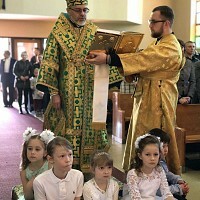 Afterwards, all those present came forward to venerate the holy Relic of Saint Nicholas being held by Metropolitan Antony. 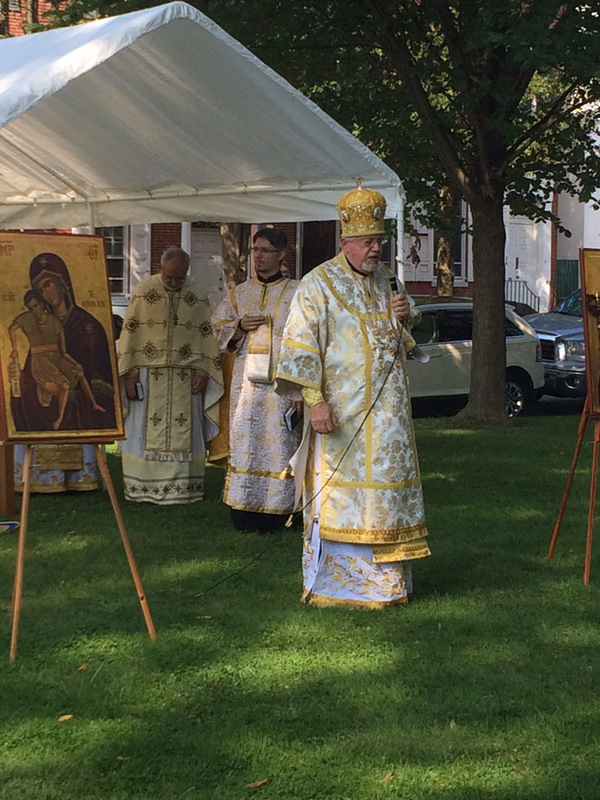 Father Anthony held the Precious Cross and Father Stephen held the Icon of St. Nicholas. The ladies of the Parish prepared a ham dinner for the feast. There was so much food, it was truly a great banquet. Father Stephen spoke, thanking everyone for their faith, their hope and their future in Christ. He reminded them that in 2007, some of the people of Dover, DE came to him with the request of forming a Mission Parish there. With the permission and blessing of then, Archbishop Antony a meeting was called and on Saturday, January 26th, 2008, a meeting was called at the home of Edward and Cheryl Zabowski for this purpose. The meeting followed Great Vespers and it was chaired by Very Rev. Stephen Hutnick with twelve people in attendance: Esther Belliveau, Frank Biddle, Sonja Biddle, Sylvia Holt, +Norman Kristic, Robert Perrine, Veronica Perrine, Vince Spelock, Dana Spelock, Ralph Vurgich, and Edward Zabowski, Cheryl Zabowski. Today, we have grown from 12 to about 50 adults, all for the glory of God. He reminded the faithful that His Eminence, Metropolitan Antony and His Eminence, Archbishop Daniel have on their calendars December 16th for the Patronal Feastday and the consecration of the new Church. Father Robert, Dean of the Mid-Atlantic Deanery, spoke to the faithful. He was also a Mission Parish Pastor and spoke of the sometimes roller coaster ride and hardships that it requires. But with faith in Christ and perseverance, great things can and will happen. Father Anthony also spoke and greeted those present. He spoke about the energy level in the Parish and that God would provide His grace for growth in love. Father Philip and Father Constantine also offered their greetings to those present. Special thanks are offered to His Eminence, Metropolitan Antony and all the clergy and seminarians, through whose prayers made the day one we shall always remember in faith and in love. To the members of the Dover Century Club for offering us a spiritual home over the past ten years. To Mark Andreas and all those present in the morning for helping in the assembly of the two tents. Also to Nancy Hlywiak and all the members of Sts. Peter and Paul Choir and the members of St. Nicholas Choir for their beautiful singing of the responses. To Edward Zabowski and Mark Jaskolka for all of their help in the logistics and work to make the day so special. To Cheryl Zabowski, general food chairperson and Dmitra Cookson, kitchen chairperson and all the ladies who coordinated and made all of the delicacies that we we enjoyed. To all who helped in the set up and clean up of the hall. Hopefully we shall continue this celebration on December 16.